#7275 Smooshee Cuddlers "Seth Goes Skateboarding"
Description: This Smooshees Cuddler set includes a Smooshee that is a humans opposed to an animal. This human Smooshee Cuddler is made of soft stuffed fabric with a pre-printed face, hair and outfit. 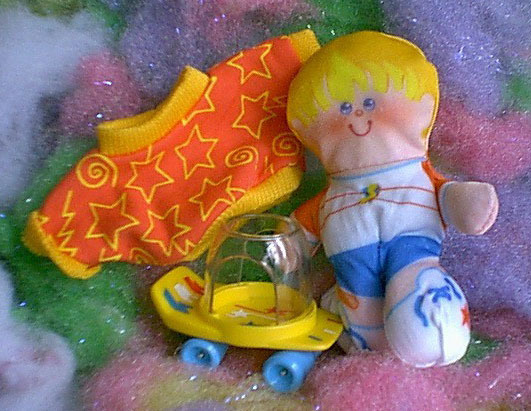 The set includes a removable one-piece outfit that fits the Cuddler, and an accessory skateboard with wheels that the Smooshee can be smooshed into. The Smooshee is not marked with a model number, but was sold with a sewn-on tag marked "Fisher-Price" and the trademark "S" for Smooshees. Designed for children ages 4 years and older. FPT16149 - Seth - Male Smooshee with blonde printed hair, printed facial features, and printed clothing. He has blue eyes, and a red nose, and a red line smiling mouth. He has a printed white shirt with reddish-orange short-sleeves that have white and a thing blue line around the cuff. She shirt has a blue line around the collar, and 2 orange lines across the chest with a yellow "S" Smooshee trademark symbol in the center of his chest. He has blue printed shorts, an orange printed bandaid on his knee, and white printed shoes with blue shoelaces and orange stars on the sides. FPT16150 - Small orange long-sleeve sweater with a yellow collar and bottom cuff, and yellow cuffs around the sleeves. The shirt has printed yellow star outlines, squizzly lines, and zig-zag line prints all over it. FPT16151 - Small yellow skateboard with 4 blue wheels that roll, and a clear plastic dome on top that a Smooshee can be smooshed into. The dome has a hole in the top, and on 2 sides. The skateboard has red, white, and blue star and lightling bolt designs on the top. FP7275BOX1988 (Box ONLY) - This set was sold in a 11" long, 8-15/16" high, 2-3/4" deep display box.